Jaguar Vision II is elegant, dynamic, refreshing & sweet enough to attract woman. Jaguar Vision II for men 100ml. Eau De Toilette is a fruity and fresh scent. Like a burst of fresh air on a hot summer day, top notes of spicy cardamom, grapefruit, Amalfi lemon and juicy pineapple graduate into an aromatic heart of cedar and patchouli. A masculine base of tonka bean, white musk and golden amber give Jaguar Vision II a high degree of longevity for a scent you can detect throughout the day. When a man needs confirmation of his status and success, he buys for himself luxury cars, high-quality clothes and exclusive accessories. Perfumery Jaguar Vision II, released in the year 201, it is an example of such an accessory, because it gives a man a unique charm and fascination. Fruit water and woody fragrance opens a variety of music, poured hundreds of shades that add up to a charming song of courage, sexuality and youth. Bouquet fragrance has a unique dynamic modern sound that conveys the image of a cosmopolitan man, intelligent and aristocratic, noble and courageous. For him, this charming built invigorating composition of juicy fruit, savory spice and exclusive music. Not for nothing is concluded in the most gentle fragrance transparent bottle classic rectangular shape. High vessel from becoming powerful glass ornament perfume collection of modern man just as chic and Jaguar will be a worthy completion of the automotive. 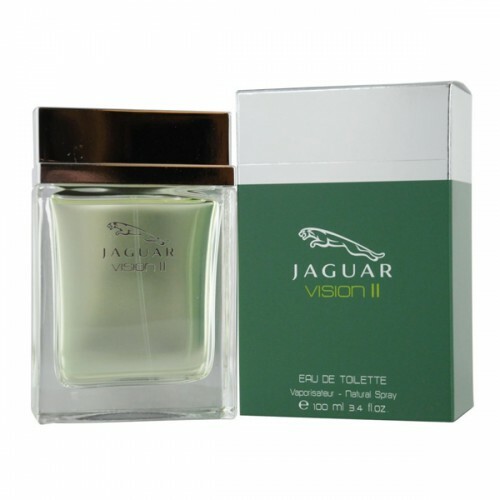 Jaguar Vision II shimmering sensuality and eccentricity because invigorating composition of this charming bouquet becomes a marvelous addition to any man's or image along. A representative of a strong half wants to become the owner of this attractive and unusual aura. Perfume Jaguar Vision II opens first avant-garde notes of coriander, sweet and juicy watermelon in combination with spicy apples. Heart chords reflect a somewhat different mood that conveys cheerfulness and courage, stylish accent in the aquatic freshness and lightness. In addition, the heart notes shimmer audacity and charm bitter notes of geranium and white pepper. At the same chords base notes Jaguar Vision II completed several other sweetish notes and dynamic molecules Lorenox, which sends notes of musk and wood, exotic patchouli and cedar tart. Bouquet becomes the embodiment of courage, strength, and sexuality, as well as the attractive power of masculinity.